John the Baptist, appears in the wilderness, baptizing and telling everyone that they must clean up their lives, because just around the corner someone very important is about to arrive! 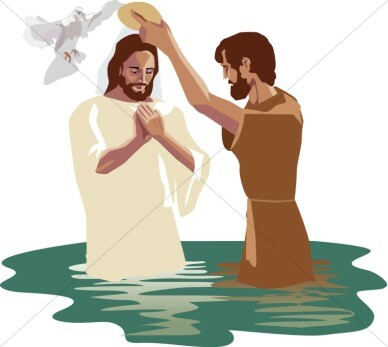 He is much mightier than John, someone whose sandals John is not worthy to stoop down and tie; someone who will not just baptize with water as John did but with the Holy Spirit. What does it mean to be “a chip off the old block?” Someone takes an axe and chips a small piece of wood off a tree. Even though its shape and feel may be different, it is still of the same stuff; It shares some of the same characteristics as the tree from which it came. When the voice of God announces, “You are my Son, the Beloved; with you I am well pleased,” it means that Jesus is “a chip off the old block.” He is of the same stuff of his Father in heaven. When we look at this Jesus, when we see his character, when we notice how he relates to people, when we hear what he has to say, we see and hear God. Think about how much our families shape us. Parents are a powerful force in shaping the lives of their children for good and for ill. Sometimes, the way we’re influenced is less than great. I have my mom’s tendency to worry and get anxious about things. I have my Dad’s tendency to be stubborn. The deeper we dig, the more we can see how we are “chips off the old block” . . . of our parents and their parents and their parents and their parents . . . going all the way back to our first parents, Adam and Eve. What we have received from them is not pretty. When we are ashamed of what we have done, when we fail at obedience to God, we see that we are “chips off the old block” of Adam and Eve. We are sinners. You remember the story. Adam and Even disobeyed God in the Garden of Eden – they rejected God’s command, they chose what they wanted over what God wanted. And that tendency to rebel against God and to disobey God’s commands has been passed on from our first parents down to us. Is there any hope for us? Is there any way to escape the influence of our first parents? Can we be born into a new family? Well, the amazing good news today is that it is possible to change the family tree from which we have already grown! A member of a previous church I served had fruit trees. He explained to me how cuttings from fruit trees are difficult to root; therefore, grafting is the most efficient means of reproducing them. Basically, grafting is joining a branch with an existing tree or root system. The Apostle Paul picks up this imagery of grafting in Romans chapter 11. Paul writes, “Some of the branches were broken off, and you, a wild olive shoot, were grafted into their place to share the rich root of the olive tree.” (Romans 11:17) In that verse, Christ is symbolized by the tree, and we are symbolized by branches that are grafted into the tree that is Christ. For John the Baptist, this was a new thing. John thought baptism was supposed to be a sign of our commitment to God, a sign that we’re going to clean up our life. Since Jesus was already a “chip off the old block of God,” Jesus did not need to be baptized. Jesus did not need to get his life cleaned up. John needed to be baptized by Him. But Jesus answered, “Let it be so now; for it is proper for us in this way to fulfill all righteousness.” (3:15) what did Jesus mean by that? Jesus had a different understanding of baptism from John. For Jesus, his baptism was not about his commitment to God, but about God’s commitment to all humanity through his Son, Jesus. Jesus was baptized in order to restore us to a right relationship with God. When we are baptized, we are baptized in the name of Jesus, the only Son of God. To be baptized “in his name” means to be baptized into his family. And so, in our baptism, Jesus takes us into his family, as his brothers and sisters, and sons and daughters of God. It means that we have a fresh start, a new beginning and a forgiven past. It means that the mistakes, failures and family secrets that have made a stain on our lives no longer need to haunt us and pull us to the ground. We are able to stand tall, unashamed, and renewed, because as the sons and daughters of God, we are “chips off a new block.” We now have an inheritance in heaven that comes with being children of God, and we can live our lives confident that nothing can destroy that relationship. We get to pray and talk to God and know that he hears us, because his is our Father in heaven and we are his children. We get to learn from God’s son, Jesus. We are given the Holy Spirit to be our helper and guide. We get to live in fellowship with our brothers and sisters in Christ. And our lives begin to reflect the character of our Heavenly Father and of his Son, Jesus. Nothing can ever undo the fact of our Baptism. No one can ever silence or reverse the promise of our heavenly Father. Through our baptism, God promises so to shape our lives that when others see us, they will say, “These people are just like their heavenly Father. They are ‘chips off the old block. And what a Father he must be!